A 2018 survey of 2,000 adults found that more than half of Brits believe they’re ‘lucky in love’. The survey commissioned by TopRatedCasinos.co.uk found that UK residents are optimistic when it comes to dating; 58% believe there's someone out there for everyone, while over half consider themselves to be a good catch. This comes as somewhat of a surprise, considering just 37% of respondents believe they're a lucky person in general. 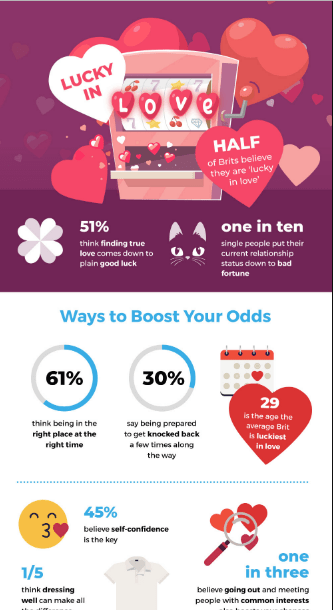 TopRatedCasinos.co.uk has put together an infographic that shows just how lucky the UK feels when it comes to falling in love.